Ahead of playing at The Stand BBQustic, a day of food and music at the Newcastle comedy club on Saturday 21st July, we caught up with acoustic musician nearly Dennis to find out more. My name’s Jack, I go by nearly Dennis, and I work as a cover singer most of the time but play blues music a lot of the time. I’ve recently made the steps to start my own blues band and play bass in a band called the escapades (check us out on Spotify and Facebook and that). Other than music I can be found trying to win drinks off people with card tricks and table magic around pubs in toon. David Gray – White Ladder, I had many a cassette Michael Jackson single before that but they were always birthday presents. I have an obsession with musicals. Little Shop and Rent are probably the tops. Into The Wild, I love a “based on a true story” film. Got a good back story to how it became a film too. Same as my guilty music pleasure. I’m not even that guilty. Coin toss between Dexter and House. There’s a series by an author called David Maine. He writes the bible stories as clever novels as if they really happened. Fallen is probably his best. Who – wor lass. She’s a crease. What – nights out with the musicians off the scene I hang about with. Never a dull moment. The current state of the world in general. Freezing time. You could do out. Win pub quizzes, jump a queue, catch a bus. The possibility’s are endless. Roald Dahl, Darwin, Stephen Fry. Few nibbles and cans and I just think that would be a mint night in. 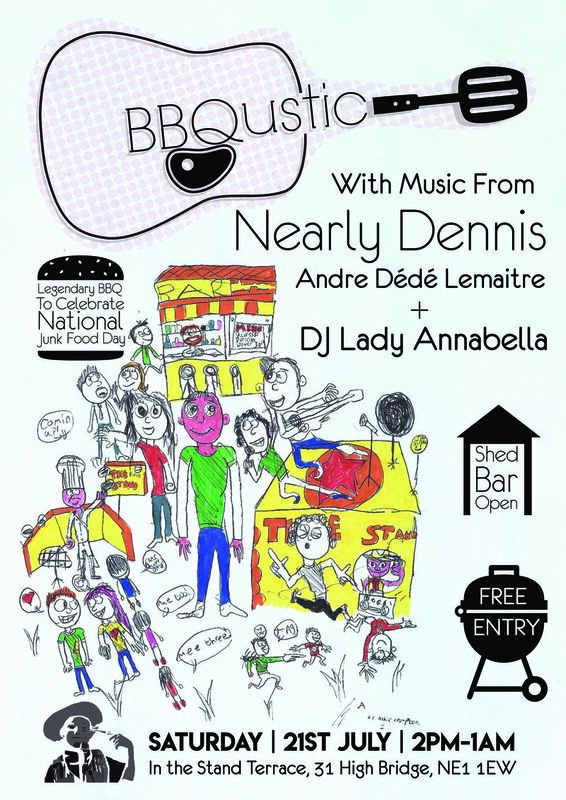 nearly Dennis plays The Stand BBQustic at The Stand, Newcastle on Saturday 21st July.